Doors: 2:30PM. Program 3-5PM. Reception to follow. *Cash/credit card accepted at door + raffle. 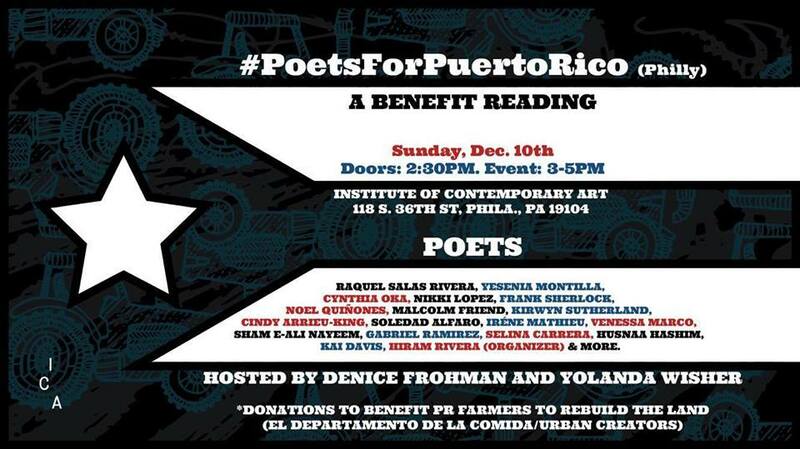 "Poets & community gather to raise funds & raise consciousness about the devastation in Puerto Rico--both the natural disaster & the political one. Poets: Raquel Salas Rivera, Yesenia Montilla, Cynthia Dewi Oka, Nikki Lopez, Frank Sherlock, Noel Quiñones, Malcolm Friend, Kirwyn Sutherland, Cindy Arrieu-King, Soledad Alfaro, Iréne Mathieu, Venessa Marco, Sham E-Ali Nayeem, Gabriel Ramirez, Selina Carrera, Husnaa Hashim, Kai Davis, Ursula Rucker, Julia Lopez, Hiram Rivera (organizer). Partners: Free Library of Philadelphia, GALAEI, Penn Creative Writing Program, Afrotaino Productions, Writers Resist Philadelphia, Philadelphia Contemporary, Thread Makes Blanket Press, Center for Programs in Contemporary Writing, Painted Bride Quarterly, Scoundrel Time, Historic Germantown, New Sanctuary Movement of Philadelphia, Asian Arts Initiative, Apiary Magazine, Taller Puertorriqueño, Weaver Way Co-op, Institute of Contemporary Art (venue partner). Proceeds: benefit Puerto Rican farmers to rebuild the land (El Departamento de la Comida). Urban Creators will send a brigade from Philly to deliver supplies & work on first five farms."